Welcome to Glenelg beach! You read that correctly. These are one of those words where the word can be spelt backwards! Don’t ask me how to pronounce this though, it’s going to sound like I am trying to say something three buns in my mouth. 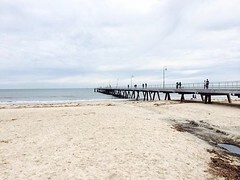 The Glenelg beach is one of the most popular beaches in Adelaide, situated on Jetty Road. You can take a nice stroll down the beach path (although it was quite chilly and windy on this day). You can also warm up with a nice alcoholic beverage at one of the many bars that is along Jetty Road and Moseley Square. Girls, there are also some shops here (tea houses, art stores etc) for you to look at. Guys, if you are anything like me you should just find a bar and grab a cold one while waiting for your lady to finish shopping. From the pictures you can see I went on the bridge that goes into the waters. I think if it wasn’t so windy and chilly it would have been really nice! A lot of couples were here taking pictures too, so for you lovebirds you can come to this part for some nice photos. I believe you can get to the Glenelg beach via the tram, which will take about 30 – 40 minutes from the city center. Or if you are lazy like us, you will just take a cab, which will cut down your travel time to about 15 minutes. On a sunday afternoon, strolling down the Glenelg beach will be a relaxing experience! 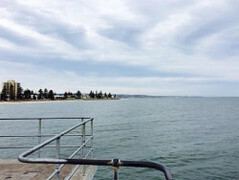 I was taken by your photograph of the Glenelg Jetty. The hotel at right was called the Grand Hotel back in the 90’s and my family enjoyed a 2 week stay there. 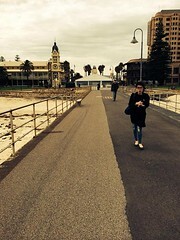 Glenelg is a great spot. Just far enough from the CBD to make it a refreshing stop. The beach is terrific and often pods of dolphin pass by as the water is usually calm. wow great commentary!! much more details than my blog. Thanks for coming by!